I mentioned to burgeoning runner and friend, Josh Wallach, that I was going to hit another “downhill” run on the treadmill today. He was curious how that’s achieved. While my treadmill does allow for decline of -2%, that’s really not enough to simulate the kind of negative grade found on many race courses, including the ones I’m running this fall. 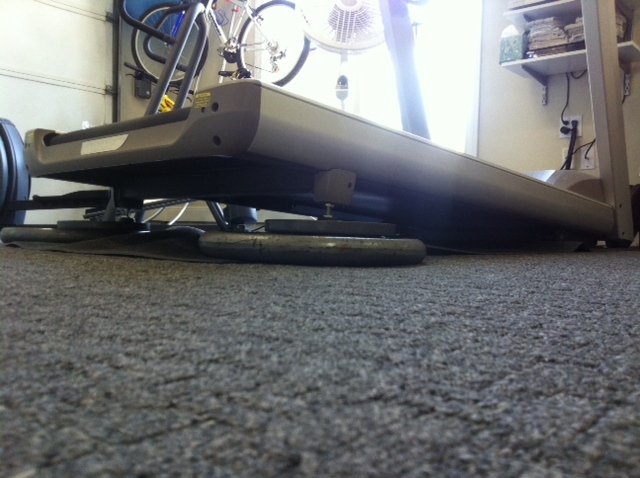 To get closer to what I’d guess is around -7% grade, I prop the back of the treadmill up. While on a recent trip to Orlando, I did it with towels but free weight plates make for a more solid platform so that’s how I do it at home. Though tough on the leg muscles and connective tissue (kind of the point), I really like this kind of workout. It makes running a 6:40/M pace feel like 8:00/M pace and I know the resulting soreness means I’m getting stronger right where I need to. Today’s 6M took 44 minutes, which included an easy first mile. Normally, on a flat-to-rolling course, that sort of effort would push my cardio at least a bit but there was no point where I really felt like I was working hard. The question remains: how will that sort of downhill running feel after a couple of hours? I don’t know but I feel good knowing I’m taking the steps to have my body ready to try. Nothing wrong with taking it easy sometimes. WS100: Essentially impossible or just highly improbable? I want this information to be accurate, above all else. If something isn't right, whether factual, grammatical, or contextual, please let me know!